Van De Wiele CM1, Hogan DF, Green HW 3rd, Parnell NK.Cranial vena caval syndrome secondary to transvenous pacemaker implantation in two dogs// J Vet Cardiol. 2008 Dec;10(2):155-61. Superior vena caval syndrome is a rare, but reported complication of transvenous pacemaker implantation in humans. This syndrome can occur secondary to fibrotic and/or thrombotic obstruction of venous blood flow into the right atrium. The therapeutic approach depends on the suspicion of the presence of an active thrombus and may include antithrombotics, angioplasty and/or surgical venoplasty. We describe twodogs that developed severe pleural effusion secondary to stricture formation in the cranial vena cava 4 years after dual chamber transvenouspacemaker implantation. The stenosis was most likely due to fibrosis secondary to the transvenous pacemaker leads. Balloon angioplasty of the lesion resulted in resolution of the pleural effusion in both patients. Balloon angioplasty appears to be a viable therapeutic approach in dogs with cranial vena caval syndrome caused by focal stenotic lesions. A 7-year-old, female spayed Boxer dog presented to the Purdue University Veterinary Teaching Hospital (PUVTH) for evaluation of increased respiratory effort. Past pertinent history included implantation of a transvenous, dual-chambered pacing system for idiopathic third degree atrio¬ventricular blockade 4 years prior. Physical exam¬ination revealed a distended left jugular vein (the right jugular vein was not patent due to the presence of two pacemaker leads) and decreased lung sounds ventrally. The remainder of the physical exam was unremarkable. A therapeutic thoracocentesis was performed at presentation to stabilize the patient. Thoracocentesis yielded 2.3 L of a milky-white, opaque fluid. Fluid analysis was consistent with chylothorax (fluid triglyceride, 274 mg/dL; serum triglyceride, 71 mg/ dL) with no evidence of infectious agents or neoplasia noted on cytology. Aerobic and anaerobic bacterial cultures were negative. A surface electro¬cardiogram demonstrated atrial synchronous pacing while pacemaker interrogation revealed a normally functioning VDD pacing system with appropriate sensing and pacing threshold values. Thoracic radiographs and ultrasonography did not reveal evidence of a mass or any identifiable cause for the chylothorax. Normal cardiac anatomy and function was confirmed with transthoracic echocardiography. The pacemaker leads were visualized in the right atrium and right ventricle. However, the cranial vena cava, left jugular vein and side branches of the cranial vena cava were distended. The cranial vena cava appeared to be focally narrowed as it entered the right atrium. Color Doppler imaging revealed turbulence in the suspected narrowing but an adequate angle could not be obtained to record satisfactory spectral Doppler flow. In the absence of an identifiable extramural compressive lesion (i.e. mediastinal mass), it was suspected that a mural or intraluminal obstruction, such as a stricture or thrombus secondary to the pacemaker leads was most likely. To confirm cranial caval obstruction, a diagnostic catheterization study was planned. The patient was pre-medicated with 0.2 mg/kg butorphanol IM and general anesthesia was induced with 5 mg/kg propofol IV and maintained with isoflurane in oxygen. A vascular access sheath3 was placed in the left jugular vein and a diag¬nostic angiographic catheterb was advanced into the right atrium with the assistance of a flexible wire guide.c Vascular pressures were recorded as the catheter was withdrawn from the right atrium into the cranial vena cava revealing a mean pres¬sure gradient of 5.58 mmHg (Fig. 1A). Approxi¬mately 20 ml of angiographic contrastd was injected by hand through the side arm of the vascular access sheath which revealed a focal stenosis at the insertion of the cranial vena cava into the right atrium with reduced clearance of the angiographic contrast material from the cranial vena cava and backflow into multiple side branches (Fig. 2A, Video 1). The diameter of the cranial vena cava at the level of the stricture and immediately adjacent to the stricture was measured. The decision was made to perform staged balloon angioplasty, using a balloon with a diameter approximately half of the diameter of the cranial vena cava for the first balloon in an attempt to reduce the risk of tearing the cranial vena cava or its attachment to the right atrium. A 10.0 mm balloon dilation cathetere was advanced across the stricture with the assistance of a flex¬ible wire guide.f The balloon was inflated and a distinct narrowing was seen which partially resolved as the balloon was inflated (Fig. 2B, Video 2). The inflated balloon catheter was left in place for approximately 5 min. Angioplasty with the 10 mm balloon was repeated, which revealed resolution of the original narrowing. The 10 mm balloon catheter was then removed and a 14.0 mm balloon catheterg was advanced across the area of stenosis and inflated. A narrowing was again seen with the initial inflation. With repeat balloon dilation, the narrowing resolved as the balloon was fully inflated (Fig. 2C, Video 3). The diagnostic angiographic catheterb was again advanced into the right atrium. Vascular pressures were recorded as the catheter was withdrawn into the cranial vena cava demonstrating resolution of the pres¬sure gradient between the right atrium and the cranial vena cava (Fig. 1B). Angiography was repeated which revealed more rapid clearance of the contrast from the cranial vena cava into the right atrium. The venous backflow that was seen previously was not visualized (Video 4). The stenotic lesion was still present, but the diameter right atrium into the cranial vena cava prior to balloon angioplasty. A pressure gradient is noted as the catheter crosses the stricture. (B) Pressure tracing repeated as in (A) following balloon angioplasty. The previously noted pressure gradient is abolished. (Red tracing, pressure in mmHg; blue tracing, ECG in mV). Figure 1 Case one. (A) Pressure tracing recorded as the catheter is withdrawn from the of the stenosis had increased. The patient recovered from anesthesia without complication. Thoracic radiographs repeated 12 h following angioplasty demonstrated the presence of a mild amount of pleural effusion. The dog was discharged from the hospital the following day on oral antibiotics (cephalexin, 22 mg/kg PO q 8 h). The patient returned to the PUVTH five days later for re-evaluation. Thoracic radiographs were repeated and showed persistent pleural effusion. Thoracocentesis was performed and yielded 1.3 L of fluid. At that time a low-fat diet and oral rutin (55 mg/kg PO q 8 h) were prescribed. One week later the dog was seen for re-evaluation which revealed resolution of the pleural effusion. Compliance with the low-fat diet and rutin therapy was poor and these were discontinued 6 months later. There has not been a return of the pleural effusion for the remainder of the 1-year follow-up period. Figure 2 Case one. (A) Still angiogram of the cranial vena cava and right atrium. The pacemaker leads are seen in the cranial vena cava, right atrium and right ventricle. Motion artifact of the atrial lead is present and the ventricular lead is seen traversing the tricuspid valve. The cranial vena cava is distended and the entrance in the right atrium is stenotic (arrow). Backflow into peripheral veins is also noted. (B) Still image of the balloon angioplasty. The 10.0 mm balloon is positioned across the stenotic lesion, creating a waist in the balloon (arrows) prior to full inflation. (C) Similar image as seen in (B) following full inflation of the 14.0 mm balloon catheter. The previously noted waist is almost completely resolved. (D) Still angiogram of the cranial vena cava and right atrium following balloon angioplasty. The diameter of the stenosis is increased and there is resolution of the backflow of contrast into the peripheral veins. A 12-year-old, female spayed Cocker Spaniel dog presented to the PUVTH for evaluation of severe pleural effusion. The patient presented to an emergency clinic 24 h prior, where 500 mL of a modified transudate had been removed from the pleural space. The patient’s history included implantation of a transvenous, dual-chambered pacing system for idiopathic, high grade, second degree atrioventricular blockade 4 years previ¬ously. On physical examination a distended left jugular vein (the right jugular vein was not patent due to the presence of pacemaker leads) and decreased lung sounds ventrally were noted. A surface electrocardiogram demonstrated atrial synchronous pacing while pacemaker inter¬rogation revealed a normally functioning DDD pacing system with appropriate sensing and pacing threshold values. Thoracic radiographs were performed and showed a mild amount of pleural effusion with no evidence of a thoracic mass. 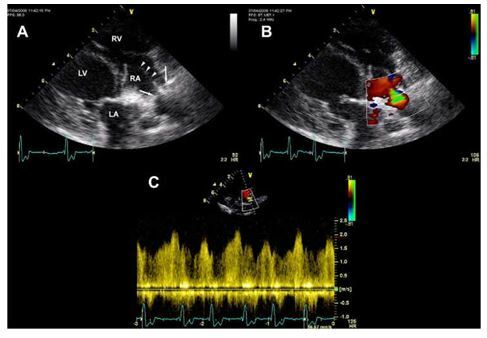 Transthoracic echocardiography revealed a dilated left ventricle and mild systolic dysfunction. The pacemaker leads were visualized in the right atrium and right ventricle. A focal narrowing of the cranial vena cava was seen as it entered the right atrium, while color Doppler imaging revealed turbulence across the stenosis, and spectral Doppler flow showed a mean pressure gradient of 8.98 mmHg (Fig. 3). Medical therapy for systolic dysfunction was initiated (0.25 mg/kg pimobendan PO q 12 h and 0.5 mg/kg enalapril PO q 12 h). A diagnostic catheterization study was planned to confirm cranial caval obstruction, and if present, balloon angioplasty to follow. The dog was pre-medicated with 0.5 mg/kg diazepam and 0.10 mg/kg butorphanol intrave¬nously general anesthesia was induced with 1.5 mg/kg etomidate IV and maintained with iso- flurane in oxygen. A vascular access sheath3 was placed in the left jugular vein and a diagnostic angiographic catheterb was advanced into the right atrium with the assistance of a flexible wire guide.c Vascular pressures were recorded as the catheter was withdrawn from the right atrium into the cranial vena cava revealing a mean pressure gradient of 7.0 mmHg. Approximately 12 ml of angiographic contrastd was injected by hand through the side arm of the vascular access sheath which revealed a focal stenosis within the right atrium just distal to the insertion of the cranial vena cava with reduced clearance of the angiographic contrast material from the cranial vena cava and backflow into multiple side branches (Fig. 4A). The diameter of the cranial vena cava at the level of the stricture and immediately adja¬cent to the stricture was measured. To reduce the risk for vascular thrombosis secondary to vascular endothelial injury, 300 units/kg of unfractionated heparin were administered IV prior to angioplasty. Figure 3 Case two. (A) 2D right parasternal skewed four chamber echocardiographic view. The pacemaker leads are seen in the right atrium, traversing the tricuspid valve and entering the right ventricle (arrowheads). The stenosis is seen within the proximal right atrium as the pacemaker leads cross it (arrows). LA, left atrium; LV, left ventricle; RA, right atrium; RV, right ventricle. (B) Similar 2D image as in (A) with color Doppler across the stenosis. (C) Spectral Doppler tracing across the stenosis demonstrating a mean pressure gradient of 8.98 mmHg. A 10.0 mm balloon dilation cathetere was advan¬ced across the stricture with the assistance of a flexible wire guide.f The balloon was inflated and a distinct narrowing was seen which partially resolved as the balloon was inflated (Fig. 4B). The inflated balloon catheter was left in place for approximately 2 min. This process was repeated using the same balloon and the narrowing resolved as the balloon was fully inflated. The diagnostic angiographic catheterb was again advanced into the right atrium and vascular pressures were recorded as the catheter was withdrawn into the cranial vena cava demonstrating resolution of the pressure gradient between the right atrium and the cranial vena cava. Angiography was repeated which revealed a more rapid clearance of the contrast from the cranial vena cava into the right atrium. The venous backflow that was seen previ¬ously was not visualized (Fig. 4D). While a focal narrowing was still identified, the diameter of the stenosis was increased approximately 67%. It was also noted that the distance between the two pacemaker leads as they crossed the stenosis had increased. The patient recovered from anesthesia without complication. Thoracic radiographs were repeated 12 h following angioplasty demonstrating a mild amount of pleural effusion present. The dog was discharged from the hospital that day on antithrombotic therapy (clopidogrel, 2 mg/kg PO q 24 h) and oral antibiotics (cephalexin, 22 mg/kg PO q 8 h). The patient returned to PUVTH for follow-up 6 weeks later. Thoracic radiographs revealed no evidence of pleural effusion. There has been no return of pleural effusion prior to manuscript submission. Figure 4 Case two. (A) Still angiogram of the cranial vena cava and right atrium. The pacemaker leads are seen in the cranial vena cava, right atrium and right ventricle. Motion artifact of the atrial lead is present and the ventricular lead is seen traversing the tricuspid valve. The cranial vena cava is distended and the entrance in the right atrium is stenotic (arrow). Backflow into peripheral veins is also noted. (B) Still image of the balloon angioplasty. The balloon is seen across the stenotic lesion prior to full inflation. (C) Similar image as seen in (B) following full inflation of the balloon catheter. A dramatic improvement of the stenosis is seen. (D) Still angiogram of the cranial vena cava and right atrium following balloon angioplasty. The diameter of the stenosis is increased and there is resolution of the backflow of contrast into the peripheral veins. The distance between the leads at the level of the stenosis has also increased. Cranial vena caval syndrome (CVCS) refers to the accumulation of fluid within the pleural space secondary to increased hydrostatic pressures in the cranial vena cava, due to an obstruction of venous return into the right atrium. The pleural effusion may be classified as hydrothorax or, if the increased pressure inside the vena cava is transferred to the thoracic duct, chylothorax. In the dog, chylothoraxis most commonly due to either a decrease of lymph flow or an increase in lymph production.1 Traumatic rupture of the thoracic duct is now thought to be an uncommon cause of chylothorax in the dog.2 Increased venous pressures may be secondary to increased right atrial pressures or can be caused by venous obstruction.1 Obstruction to venous flow can be caused by extramural compression, intramural constriction or an intraluminal obstruction. In these cases, no extramural compression was identified and the response to balloon dilation makes a static, intraluminal obstruction unlikely. To the authors’ knowledge, Cranial vena caval syndrome following transvenous pacemaker implantation in the dog has not been previously reported. There are several isolated reports of superior vena caval syndrome following transvenous pacemaker implantation in the human literature.3-7 This uncommon syndrome is reported to result from the development of stenosis secondary to fibrotic constriction and/or thrombotic obstruction that is likely initiated by endothelial damage caused by the pacemaker leads.8 A common site of stenosis in humans was in the superior vena cava (SVC) just proximal to the right atrium, similar to the two cases we are reporting here. In a study of 21 human necropsies with transvenous pacemakers, Lagergren et al. found that the pacemaker leads became overgrown by fibrous tissue and endothelium in the areas where they came in contact with the endothelial lining of the vessel wall and the endocardium.9 This tissue response was seen commonly in the superior vena cava just proximal to the right atrium. Although there are no large retrospective studies assessing superior vena caval syndrome in humans, one report estimated a frequency rate of 1 in 3000 to 1 in 40,000 trans¬venous pacemaker patients.8 A recent study of 136 human pacemaker patients investigated the frequency of vascular obstruction following trans¬venous pacemaker placement.10 Venography of the upper extremity veins to the superior vena cava was performed prior to and 6 months after pacemaker placement. A total of 19 patients (14%) experienced some level of obstruction while five patients (3.6%) experienced complete occlusion of the SVC. Inter¬estingly, all patients, including the complete obstructions, were asymptomatic. 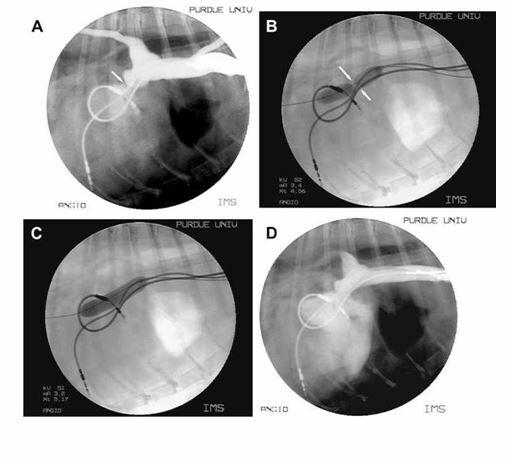 In the first case of this report, the dog accumulated an estimated 0.75 L of chylous fluid per day in the pleural space prior to balloon angioplasty. The patient was discharged from the hospital with a small amount of fluid in the pleural space. Although the fluid had not completely resolved at the 5-day follow-up re-evaluation, the amount of fluid accumulation per day had dramatically decreased (0.18 L/day). Medical management (low-fat diet and rutin therapy) were recommended at the time of the initial re-evaluation to decrease the patient’s risk of developing further fluid accumulation. However, owner compliance regarding the low-fat diet was poor. Furthermore, at present, the patient has not been on medical or dietary therapy for over 6 months with no return of the chylothorax. A total of 68 transvenous pacemakers have been placed at PUVTH over the past 9 years with 42 (61.8%) of those including a right atrial and right ventricular lead. Considering the 2 cases reported here, the incidence of cranial vena caval syndrome secondary to fibrosis of a transvenous pacemaker system at our hospital is 2.9% of all transvenous pacing systems. Interestingly, both of these cases were seen in dual chamber pacemaker patients, making the incidence in that population 4.76%. It is also interesting to note that both of these dogs developed Cranial vena caval syndrome as a very late complication (4 years post implantation). 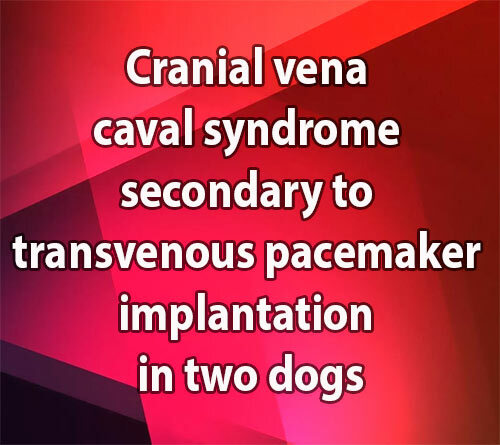 Fourteen of the 42 dogs were alive for 4 years or longer following implantation of a dual chamber pacemaker at PUVTH, making the incidence of Cranial vena caval syndrome in this sub-population 14.3%. Given the debate over recognizable clinical benefits of single versus dual-chambered pacing systems, some may consider the risk for development of CVCS unacceptable. However, this is the first report of Cranial vena caval syndrome secondary to transvenous pacing in the dog and considering that multiple institutions place dual-chamber pacing systems on a regular basis, the actual incidence of Cranial vena caval syndrome secondary to dual-chamber pacing remains unknown . Additionally, Cranial vena caval syndrome has developed secondary to a single-cham¬bered pacing system in a dog.h Therefore, the authors conclude that it would be premature to suggest that dual-chambered pacing systems have an increased risk for development of Cranial vena caval syndrome over single-chambered systems at this time. Chylothorax secondary to transvenous pace¬maker therapy in cats is a well accepted clinical syndrome among veterinary cardiologists. To our knowledge, there is no experimentally proven pathologic cause for this observation. Cranial vena caval syndrome secondary to stenosis around the pacemaker leads could explain this observation. However, further studies would be required to confirm this hypothesis. In conclusion, these two cases document the first report of cranial vena cava syndrome secondary to transvenous pacemaker therapy in the dog. Furthermore, they demonstrate the successful use of balloon angioplasty for the treatment of that complication. Fossum TW, Birchard SJ. Lymphangiographic evaluation of experimentally induced chylothorax after ligation of the cranial vena cava in dogs. Am J Vet Res 1986;47:967-971. Mertens M, Fossum T, McDonald K. Pleural and extrap¬leural diseases. In: Ettinger S, editor. Textbook of Veter¬inary Internal Medicine. Philadelphia, PA: Elsevier; 2008. p. 1272-1283. Mazzetti H, Dussaut A, Tentori C, Dussaut E, Lazzari JO. Superior vena cava occlusion and/or syndrome related to pacemaker leads. Am Heart J 1993;125:831-837. Goudevenos JA, Reid PG, Adams PC, Holden MP, Williams DO. Pacemaker-induced superior vena cava syndrome: report of four cases and review of the literature. PACE 1989;12:1890-1895. Sethi GK, Bhayana JN, Scott SM. Innominate vein throm¬bosis: a rare complication of transvenous pacemaker elec¬trodes. Am Heart J 1974;87:770-772. Chamorro H, Rao G, Wholey MH. Superior vena cava syndrome: a complication of transvenous pacemaker implantation. Radiology 1978;126:377-378. Wertheimer M, Hughes RK, Hilmon Castle C. Superior vena cava syndrome. Complication of permanent transvenous endocardial cardiac pacing. J Am Med Assoc 1973;224: 1172-1173. Blackburn T, Dunn M. Pacemaker-induced superior vena cava syndrome: consideration of management. Am Heart J 1988;116:893-896. Lagergren H, Dalgren S, Nordenstam H. Cardiovascular tissue response to intracardiac pacing. Acta Chir Scand 1966;132:696-704.